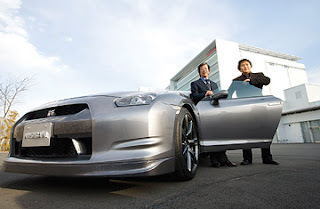 While Ghosn called the shots, Kazutoshi Mizuno, chief vehicle engineer and chief product specialist, choreographed the GT-R's journey from a Japanese concept to Germany's famed Nürburgring racetrack, where it clocked 0 to 60 m.p.h. (100 km/h) in 3.2 sec., a wink faster than Porsche's GT3. "Mizuno was responsible for cherry-picking those he wanted to work with," says Hiroshi Hasegawa, chief designer of the GT-R. "Information cascaded from him." A veteran racing-system developer and director, Mizuno asked Ghosn to allow for a race-car development method. Interesting read. Always interesting to read what the PR departments spin is, on how a car is put together.